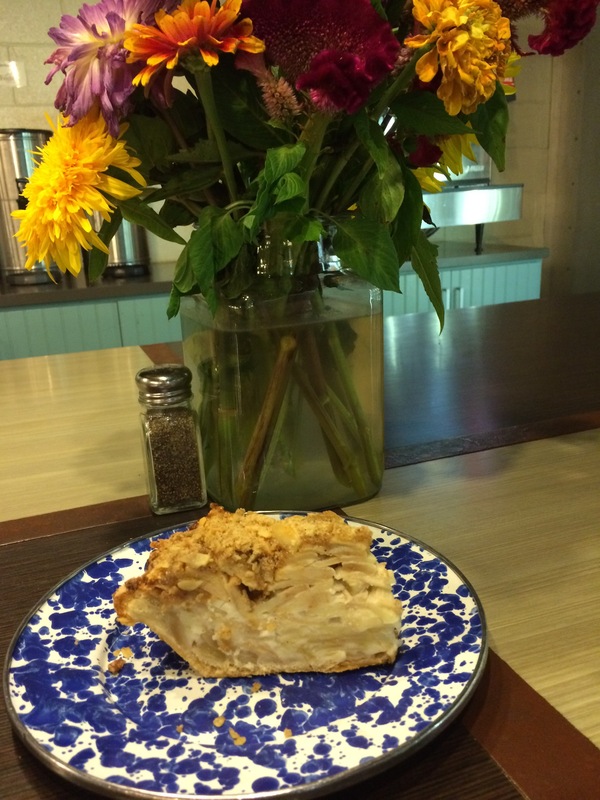 This apple cream pie was my pick because it sounded delicious. 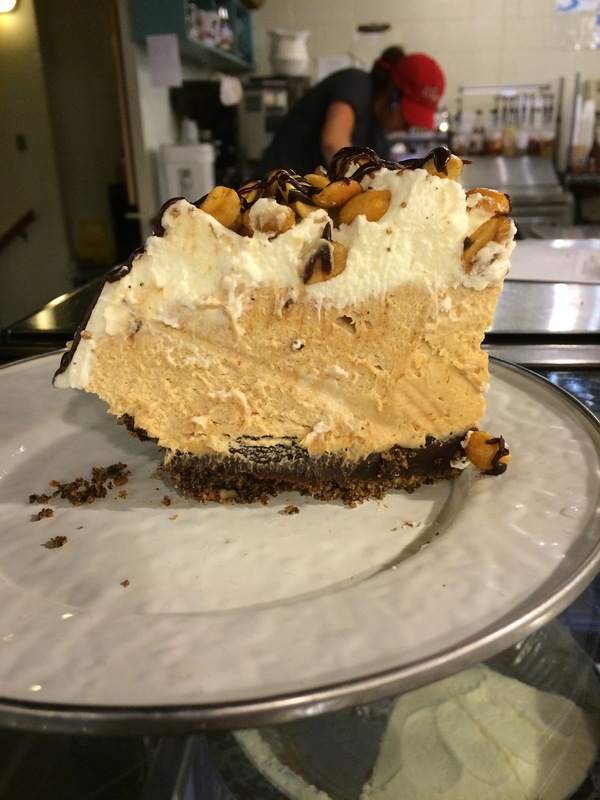 It was described as a cross between apple pie and cheesecake, but this was sadly overstated. It was really just apple pie, and there was not enough crumb topping. Well, there’s never enough crumb topping. But the apple/crumb ratio was way off. 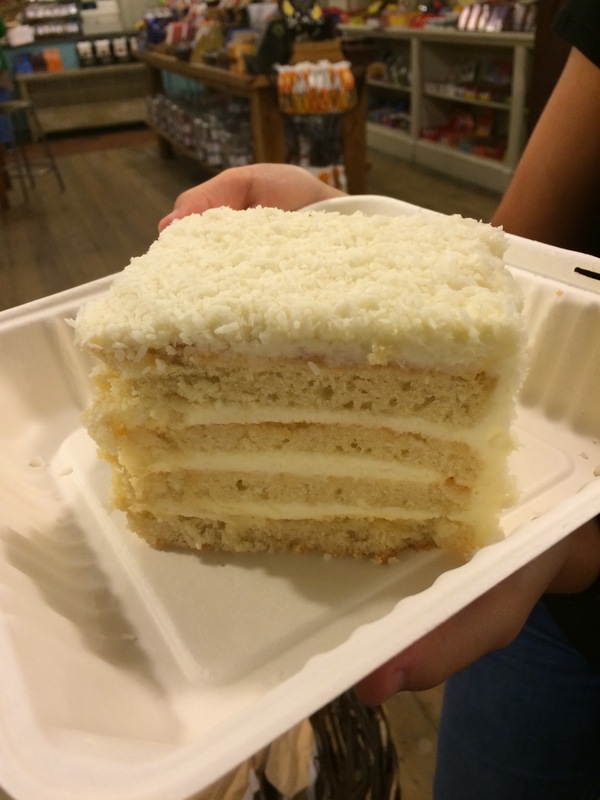 The real winner of the night was my sister’s pick of lemon coconut cake. This picture does not accurately convey how HUGE that slice of cake was. In fact, it wasn’t a slice at all. It was a slab. She automatically got it in the to-go box because there’s no way she was going to finish it in one sitting. The flavor profile was unique, the cake itself was nice and fluffy, and the icing wasn’t too sweet. … to cupcakes! 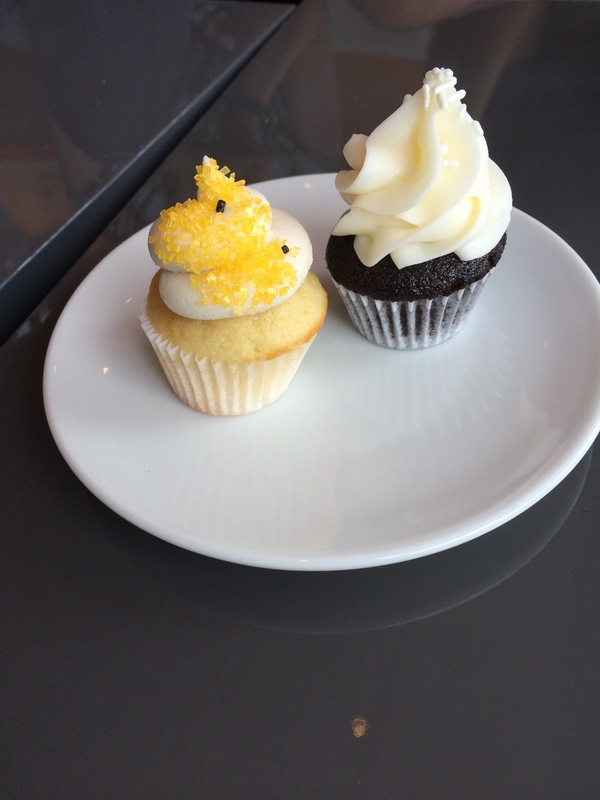 Cupcake Bar in downtown Durham was a last minute stop after lunch with friends at Bull City Burger, but it turned out to be an excellent decision for multiple reasons. First, it was the shop’s birthday, so everyone got one mini cupcake free. Second, the cupcakes were delicious! Three of us tried five flavors, and they were all excellent. 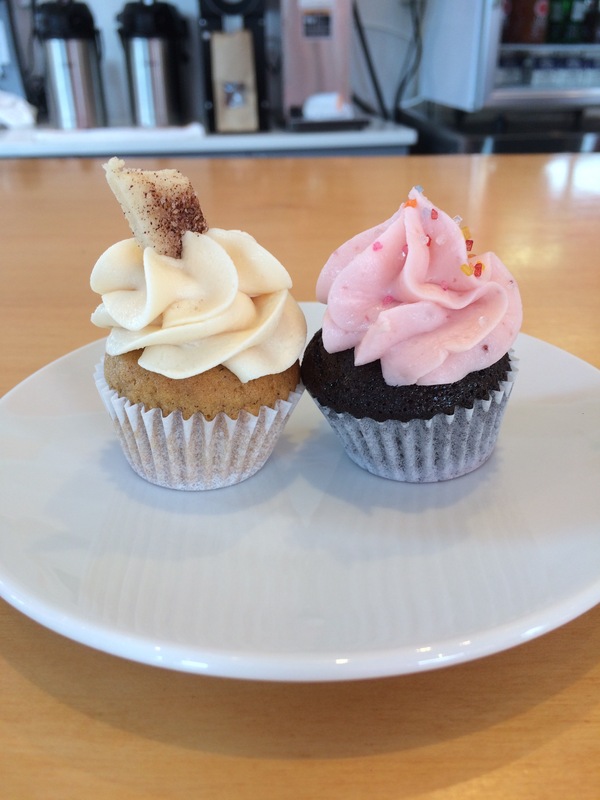 My cupcakes are the ones pictured above – sweet potato pie on the left and chocolate strawberry on the right. I couldn’t decide between sweet potato pie and honey vanilla, but the girl behind the counter told me to pick sweet potato pie, so I listened. Fortunately, she was absolutely right! The cupcake tasted just enough like sweet potato without being overwhelming, and the frosting was caramel, which is one of my favorite flavors. The little cookie stuck on top tasted like a piece of pie crust! The chocolate cake with strawberry frosting was also delicious, although not quite as unique. Again, neither flavor was too overwhelming, and they complemented each other nicely. Husband’s choices were the cinnamon spice cupcake with vanilla frosting and the chocolate cupcake with cream cheese frosting. 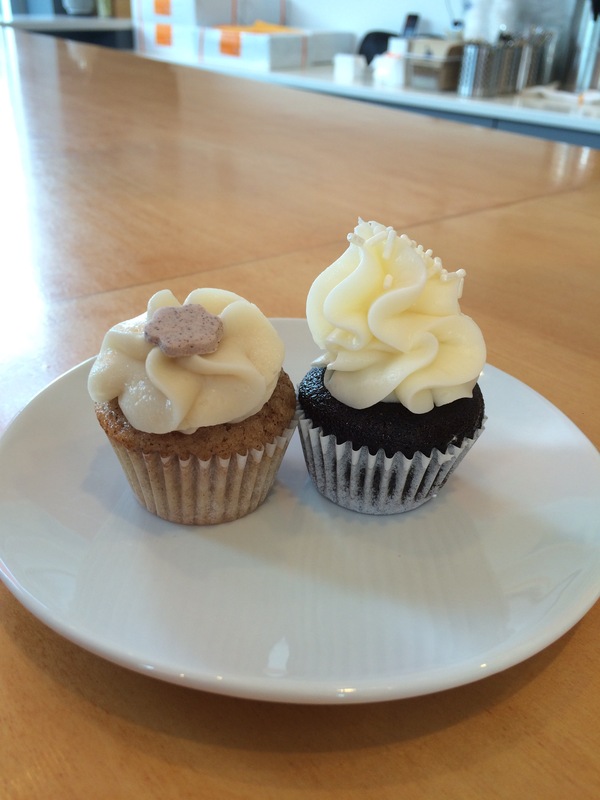 And my friend and fellow cupcake connoisseur Ashley chose the honey vanilla and the chocolate cream cheese. All three of these flavors got rave reviews! Honestly, you can’t go wrong with a cream cheese icing, and Ashley said that the honey cupcake had a good amount of honey without being overly sweet. Cupcake Bar also has frosting shots! 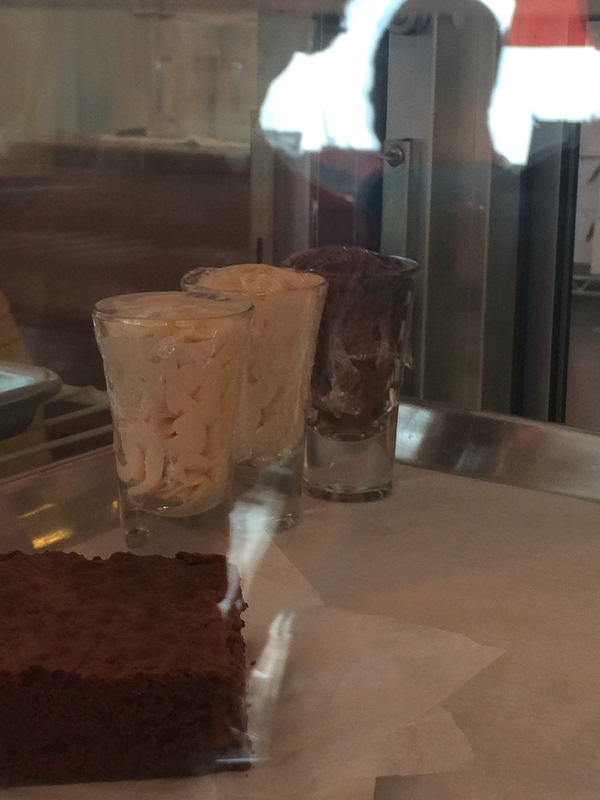 Yup, frosting in a shot glass. Brilliant. 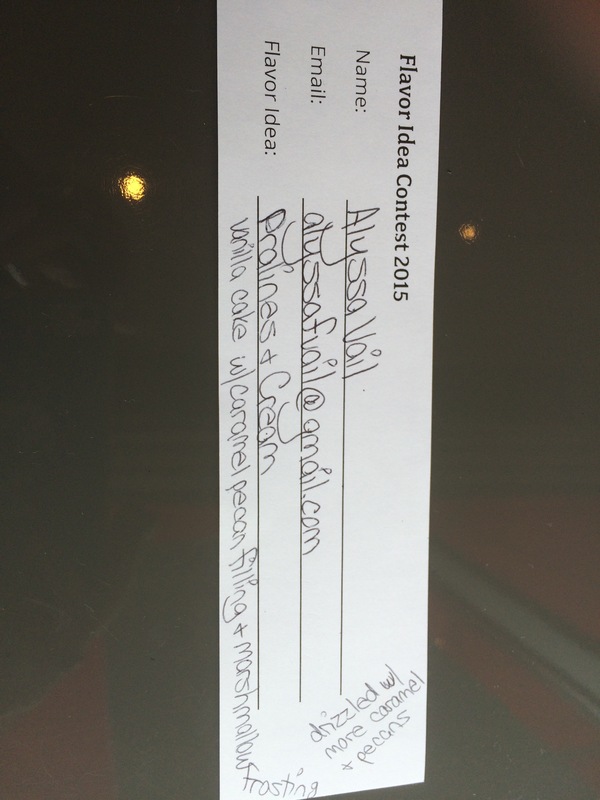 They also had a flavor contest going on, so obviously I had to submit an idea. It’s been a few weeks, so I assume that my flavor wasn’t chosen. Who thinks I should just make it myself?